One of my favourite dishes in Taiwanese cuisine Taiwanese Tan Tsai Noodle (擔仔麵). Tan Tsai Noodles are one of the best kinds of foods for the cold and wet weather we have here in Scotland most of the year around. I believe no one will say no to a big bowl of hot and tasty noodle soup. 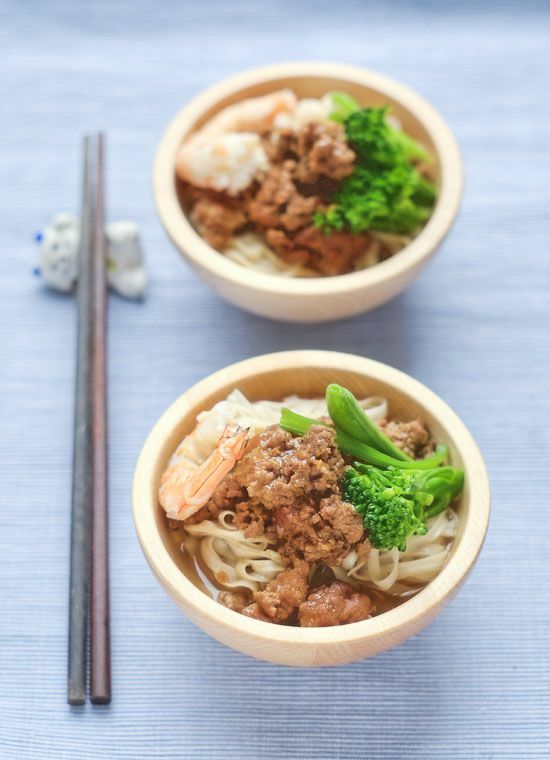 Tan Tsai Noodles are really versatile; they can be eaten either dry or with a soup and they are equally delicious either way. So whether you like noodles with or without soup, this dish can be made either way. The story of Tan Tsai Noodle began in 1895 with a fishmonger/fish man called Mr Hong. Mr Hong, whose family migrated to Fucheng from Zhanghzhou where he learnt how to cook noodles while making a living from catching fish. After some time, he moved to Tainan in Taiwan where he continued to make a living from catching fish. In Taiwan, there are numerous festivals to celebrate various things but in March we have one festival called the “Tomb-Sweeping Festival” (清明節), and another called the Moon Festival which is held in August. Between these seasons there is a period called the ‘Slack Season” where fishermen can’t go out to fish as often due to bad weather, so Mr Hong began selling noodles to support his family. His noodles had a really unique taste so they became really popular. They became so popular he decided to sell his noodles full time so during the start of his noodles business he would carry his noodles on shoulder poles so he could sell them on the streets. Mr Hong decided to call his noodles “Slack season Tan Tsai Noodles”. In modern times these noodles are known as “Tu Hsian Yueh Tan Tsai Noodles”. “Tu Hsian Yueh” (度小月) means “slack season” in Chinese and “Tan Tsai” translates to shoulder poles in Taiwanese. Remove the shells from the prawns and use a little bit of oil to sauté the prawn shell. Roast the chicken bone in the oven until the bone gets some colour on it. Put everything into a stockpot and cover the ingredients with water. Boil it first then simmer for 2 hours. It’s now ready to serve with noodle. Heat up 2 tablespoons of oil in a wok and stir-fry the pork until it’s cooked on the outside. Add all the ingredients and mix them evenly. Boil it first then simmer for around 30 minutes to reduce down half of the sauce. Poach the prawns and vegetables in a pot of boiling water first then take them out and leave aside. Then use the same water to cook the noodles. Place noodle and some minced garlic (optional) into a bowl and pour some mince sauce on top. Garnish with prawn and vegetable and add the soup. Ready to serve!